Kenya’s former Prime Minister Rt.Hon. 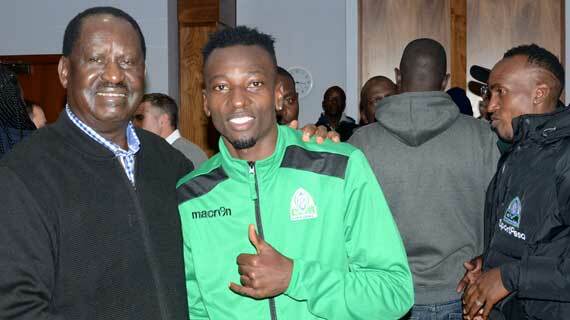 Raila Odinga paid Gor Mahia’s team a courtesy call at their team hotel in Liverpool ahead of Tuesday’s friendly against English Premiership side Everton, charging them to go in and do their best. Hon. Odinga, who is also the club patron says the team is under no pressure to go and win, but go perform to the best of their abilities. He turned the players and officials wild with this statement; “What do they have that you don’t? They have two, and you have two as well. Or do they have three?” Raila posed amidst huge laughter from the players. He has challenged them to put their best feet forward and get a result that will put Kenyan football on the map. “It’s not a matter of life and death but the most important thing is to showcase yourselves. It’s not a battle between David and Goliath, it’s between Goliath and Goliath, we want you to have confidence in yourselves.” He said.